I’ve been victimization the ASP.Net stack for five years currently, each professionally as a backend developer and designer, and in person for open and closed-source aspect comes. I do largely net applications however additionally work with massive information stacks. After some years of tinkering with the PHP system, and an inexpensive quantity of your time spent doing Java, the C# language appealed to Pine Tree State for each its effectiveness and its pleasantness to figure with. it’s consistent, totally designed, and Visual Studio is to Pine Tree State the foremost developer-friendly IDE (when operating with C#). Moreover, the ASP.Net framework contains everything a developer has to develop ASP.NET applications while not requiring further frameworks or libraries. The only problems with the ASP.Net system to Pine Tree State were of the moral matter: the language and framework were closed-source, and also the system was terribly Microsoft-oriented (even tho’ Mono provided a pleasant various to run on UNIX operating system, however with a relentless gap in supported features). Then Microsoft declared the ASP.Net Core, that carried hopes of natively cross-platform and ASCII text file ASP.Net surroundings. That’s once I begin to travel back and forth between the 2 technologies for cross-platform backend development. What follows area unit my insights on the variations between the 2 platforms in terms of the event surroundings and options. I gathered these items of knowledge when a few years of victimization these tools, and that they facilitate Pine Tree State to settle on the most effective tool for the task once I begin a brand new project. Hopefully, they’ll assist you therein consider well. Node.js is famously known for its single-threaded callback handler. What does that mean? It means that instead of handling every new HTTP request inside a dedicated thread or process (like Apache does), it does it inside a single thread. That makes the request handling in Nodejs single-threaded, whereas in Apache/PHP it is multi-threaded for instance. But Node.js takes advantages of that because it uses asynchronous system IO calls that does not block the request thread. When an IO call is made by the request thread, the IO call is executed on its own thread, and the request thread keeps going. When the IO call is done, a callback is fired on the request thread to handle the response. This makes Node.js well-suited for IO bound applications, but also introduces the so-called “callback hell”, which can introduce cyclomatic complexity to your code. Hopefully, since v7.6, Node.js implements native support for async/await of promises which makes your code far more readable and maintainable. The single-thread request handling can be clustered using Node.js native clustering, Nginx load-balancing with multiple application processes, or Node.js process managers such as PM2, which makes use of all the server cores to start up as many application processes as the CPU can handle. Historically, ASP.Net MVC (or WebApi) handles requests the traditional way, which is the Apache / PHP way: each request is processed through its own thread inside a thread pool. And each IO call is then processed synchronously inside that thread. 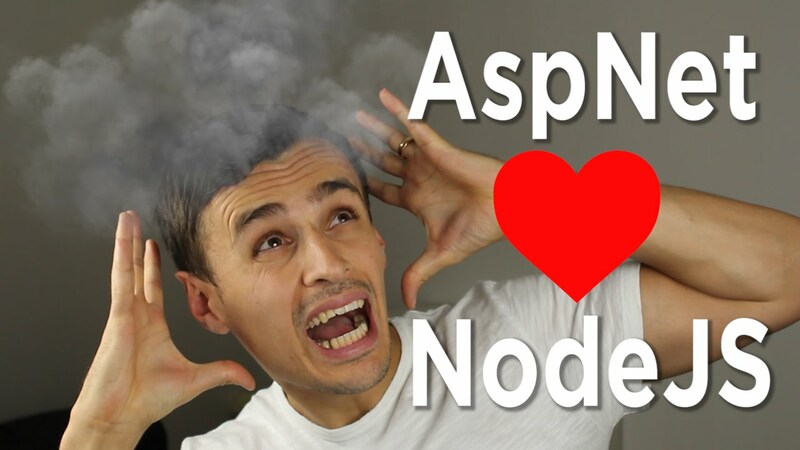 This makes the synchronous ASP.Net model less suitable than Node.js for IO bound applications, which is most of the modern applications front side. Hopefully, since ASP.Net Framework 4.5 (08/12), C# makes use of the async/await pattern, which introduces asynchronous programming for request handling. The async/await pattern introduces asynchronous programming for request handling. Indeed, each request handlers can be tagged as asynchronous, and IO calls can be awaited, which means every request will run on its own thread, and each IO call inside the request handling will be non-blocking. This Task-based model can make use of callbacks, promise, or async/await programming models. ASP.Net Core advocates the use of the async/ await pattern when writing IO bound web applications. 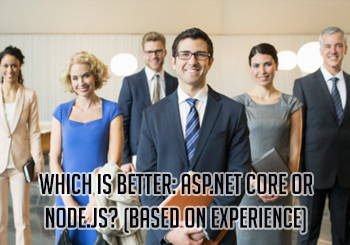 The difference between the two process model is that on the highly concurrent environment, ASP.Net Core will handle more requests because requests are handled in parallel. Although the context switching between threads can have its cost when using a lot of thread-shared variables. In that situation, Node.js could be faster. Many “mainstream” modern languages such as C# implements some sort of asynchronous IO mechanism, which is often misunderstood by the Node.js developer community and can generate an unexpected outcome. C# is far more powerful I think because it makes use of all the benefits of having a strongly-typed object-oriented programing language. The Visual Studio IDE is quite something and provides the best integration for a language (at least that’s what I think). But for a large majority of cases, and with the growing popularity of the micro-services pattern, a lot of these awesome features are not necessary for small to medium code bases. What can be complicated at first when working on a medium to the large application is the patterns to use for code refactoring and code architecture. Since the Node.js frameworks such as Express.js are very flexible, choosing the right architecture and file structure can be cumbersome, but a must-have to enhance evolutivity and maintainability of your application. The ASP.Net (Core) MVC / WebApi framework provides the developer with an already made code structure, dependency management, and code architecture. The developer still has some code-organization to make such as separating the database layer from the web one, but overall far-less time is needed to think of that. Developers used to POO paradigms will feel at ease rapidly. For simpler web apps such as light REST APIs, the Expressjs/Node.js is very straightforward and easier to start with as the boilerplate template is only one small js file and a package.json file. I found that writing simple code is a bit faster for me in Node.js than in C#. To me, that is because most simple applications (REST APIs, console application, helpers, …) take advantage of having more flexibility, as you are not designing a lot of the app ahead of development. More and more studies question the relevancy of static typing to reduce the number of bugs in an application. If such studies happen to hold some truth, then using a strongly-typed language can be more of a drawback than a benefit. Regarding debugging and Unit testing, the C# / Visual Studio combo still provides the best experience, but the Node.js / Visual Studio Code with extensions are not lagging far behind. The building time is also smaller for a Node.js application. That is the aspect where the two technologies differ the most. Node.js relies on a very large community writing a lot of modules in its main package management system (NPM). Most of the popular frameworks and libraries rely on a lot of small packages to work. This provides new developers with a lot of available modules to respond to the always-shrinking development time. But it can also have side-effects on the entire ecosystem when a package is updated or pulled off. A lot of these packages are also not well maintained and error-prone. The ASP.Net Core framework, on the other hand, is developed by a dedicated Microsoft team entirely, and provide everything you need to build a fully functional website. Third-party packages are often well built and backed by large companies. This might come from the historic affinity of Node.js with MongoDB and the MEAN stack. MongoDB being a NoSQL flexible JSON data store, a full-featured ORM has no meaning with it. There is also Now, which offers a one-liner for Node.js deployment with no configuration. There is also a lot of CI&CD platform that can build, test and deploy your Node.js code with ease (Travis, Codeship, Circle CI). For CI & CD, I only know of Visual Studio Team Services that do that in the cloud. The Node.js asynchronous event-driven request handling model is not that far from the ASP.Net async/await multi-threaded one. Node.js performances are not always better than ASP.Net Core ones. They even tend to be worse, even though the difference might not matter for common apps. CPU-bound apps will generate bottlenecks. ASP.Net (Core) is mostly preferred for large code-base as it provides ready-made software architecture and tooling that fits most needs. For micro-services or small to medium-sized REST APIs, Node.js provides a nice alternative for lean development with many hosting and CI&CD services available. As always, there is not a better tool for each scenario, try and pick the one that fits your requirements.